Spinach, sundried tomatoes, caramelized onions and Fontiago cheese on a multigrain ciabatta bun. multigrain roll (unbleached enriched flour [wheat flour, niacin, reduced iron, thiamine mononitrate, riboflavin, folic acid], whole grain wheat flour, water, cracked wheat, flax seeds, corn meal, pearled barley, rolled oats, brown rice, rye, triticale, sesame seeds, buckwheat, millet, cracked durum, sea salt, yeast, malt), fried egg (egg whites, egg yolks, milk, food starch-modified, contains 2% or less of the following: salt, citric acid), sun-dried tomato and onion sauce (sun-dried tomato [contains sulfur dioxide-as a preservative], caramelized onions [onion, canola oil], water, canola oil, parmesan cheese [milk, salt, cellulose, whey protein concentrate, lipase, microbial enzyme, bacterial culture, natamycin], balsamic vinegar [wine vinegar, grape must, caramel color], salt, basil, garlic, modified corn starch, sugar, spices, lemon juice concentrate), fontiago cheese (pasteurized cultured milk, salt, enzymes), spinach. 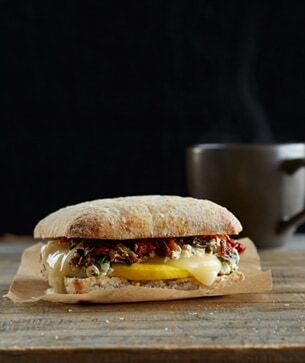 Our Vegetable & Fontiago Breakfast Sandwich is a garden of pure delight. Leafy, green spinach. Sweet caramelized onions. Fontiago cheese—a combination of the flavors of sweet Fontina and tangy Asiago cheeses. And sundried tomatoes for a burst of flavor. Is your mouth watering yet? Tomatoes were originally sundried as a way to preserve them (before canning methods were developed).